Well, as much as I have been avoiding this, I decided to look at my homesteading schedule to see how well we have done so far. I thought it would be discouraging, but it didn’t turn out to be. We really did accomplish quite a lot on our list and put some things to the side on purpose. We haven’t ordered chicks. Sadly. But part of that is because I’m hoping to hatch some this year. I’m thinking that we’ll hatch some chicks for meat and purchase chicks to grow out and add to the layer flock. I’m really excited to add Australorpes, Blue Orpingtons, and Jersey Giants. I might even add a silkie or two for their broodiness if I don’t see our Buckeyes going broody. We were also thinking of adding turkeys this year, but I’m thinking we’ll buy hatching eggs from our friend who just purchased a Bourban Red breeding pair. We started estimating the cost of the homestead, and that’s why we haven’t made the chick purchases or the perennial fruit purchases. Even though we would very much prefer to start the berry trees this year, it’s the start up that’s hard. It is a worthwhile investment since it gives back each year, but we still need to make choices. Hopefully we’ll be able to make room for these soon. We also didn’t join Small and Beginner Farmers yet. Gotta work on that. Still Home remodeling… We finished painting the kitchen cabinets. We still have base boards, door trims, and counter tops to do. The bathroom has waited over a year to have the floor replaced after the Noah induced flood. We’ll get there. There will be a major room switch soon, so we’ll repaint a few rooms, and hopefully do all the above. March is a slow month, so we have time. Joel has been reading about bees and is very excited to get them started this year. He hasn’t started building the top bar hives, but has the plans. I’m also considering doing langstroth, but foundationless after reading a great article on Runamuk Acres. We didn’t get the greenhouse put up, but we haven’t needed it quite yet, and I’m sure we’ll get there, too. We still have to do the tree work, clean the chicken coop and wait for the calf! That above list isn't bad to me! I know we made some progress in each area, or made a choice to put it off. Studied Bees - although we need to study more. Now, I still need to keep up with my seed starting schedule – which I haven’t. I’m one week behind on a few things, so this will be a major seed starting week. But the onions came up okay, and we have decided that we’ll just plant whatever comes out of the starts in the companion style we originally planned, and then have a bed of direct seeded onions that we'll use a hoop tunnel to extend into the fall season. That way our seeds still have enough time to mature! 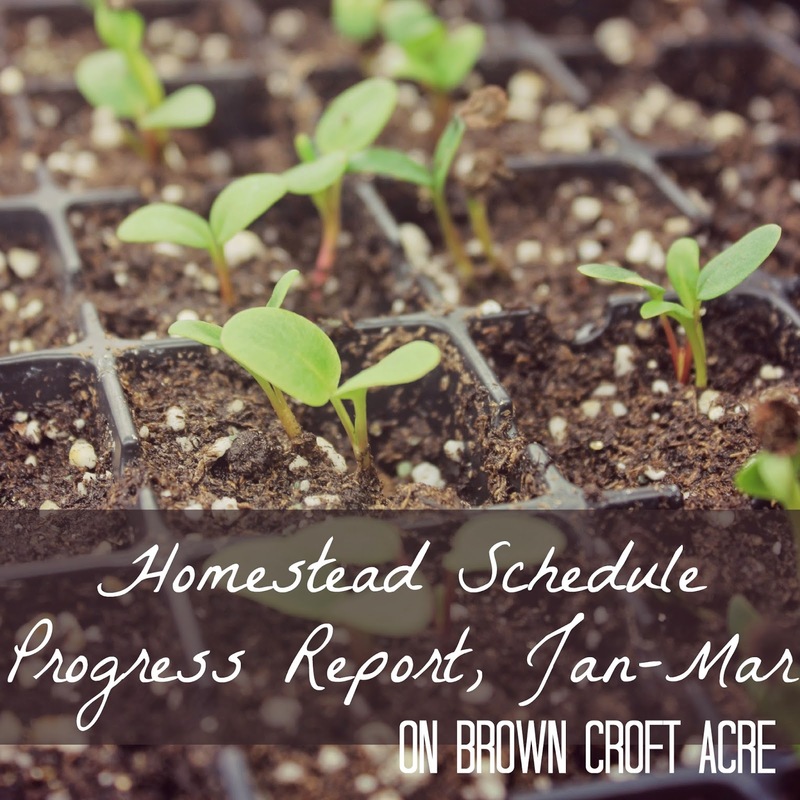 How have you been doing on your goals and homesteading schedule this year? It's good to have a plan so you know where to go. I know that sounds cliche, but it's very true. It sounds like you've done very well and have accomplished quite a bit on your list. Enjoy the work and the progress. Thank you for sharing this at the HomeAcre Hop; I hope you'll join us again this Thursday. It's definitely true. I need some sort of guide so I don't go off on too many bunny trails. We are definitely enjoying the homesteading life. I'll try to drop by next Thursday. Thanks!